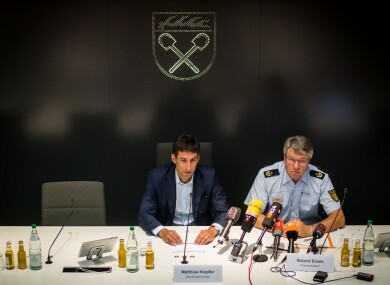 Matthias Klopfer (l, SPD), Mayor of Schorndorf, and Roland Eisele (r), President of the Police in Aalen, speak about the city festival 'Schorndorfer Woche'. GERMAN POLICE SAY that several assaults and cases of sexual harassment were reported in alcohol-fuelled weekend disturbances that saw youths rampage through a small town and hurl bottles at police. No arrests had been made over the alleged harassment, but police were treating as a suspect a 20-year-old Iraqi man and, in a separate case in which a 17-year-old girl was groped, three Afghan asylum seekers aged 18-20. Police chief Roland Eisele urged other women to come forward if they were abused on Friday or Saturday night during the chaotic scenes that started at a local festival in the southwestern town of Schorndorf, Baden-Wuerttemberg state. Eisele said “the aggression and escalation of violence” were unprecedented and unexpected in the town of about 40,000 people, located near Stuttgart, and that the local police force had to request backup from other cities. Police said in a statement that many youths “with migrant backgrounds” were seen in the crowd, but Eisele said that it was impossible to estimate a percentage. Officers in riot gear moved into a crowd of about 1,000 Saturday night in the town centre to detain a suspect on charges of dangerous physical assault but came under attack as others hurled bottles at them. Witnesses had reported small groups of youths, some armed with knives or replica handguns that can fire flares and teargas, roving through the medieval town centre, police said. Several police cars were sprayed with graffiti or otherwise vandalised in the small town also dubbed “Daimler city” because automotive inventor Gottlieb Daimler was born there in 1834. In a press conference, Eisele evoked the chaos of Cologne’s infamous 2015 New Year’s Eve celebrations when men of North African and Middle Eastern appearance groped and assaulted hundreds of women, sparking widespread public outrage. He stressed that the rowdy scenes in Schorndorf were less intense than those in Cologne or the riots in the northern port-city of Hamburg before and during the July 7-8 Group of 20 summit, when far-left and anarchist militants burnt street barricades and threw rocks from rooftops. Email “Women abused and bottles hurled at chaotic German town festival”. Feedback on “Women abused and bottles hurled at chaotic German town festival”.